Last winter was truly a whirlwind for our family. My husband got a new job; a wonderful, new job that has allowed for a better work-life balance & exciting opportunities. However, this also meant that he was away from home for training throughout the first two weeks of December. Karissa & I launched Adore Them in January, my younger son had surgery in January, my older son was having evaluations & meetings regarding the gifted program at school, I had surgery in February, & then my son needed another surgery in March. Leading up to all of that craziness, was of course the Christmas season. This unusually hectic winter allowed me to re-evaluate my holiday expectations. It allowed me to take a step back & think about what I could reasonably accomplish, & also what we would genuinely enjoy. I was able to cut back last holiday season to make everything more manageable, & it was such a good experience that I am taking a similar approach this year as well! I didn’t realize how much effort I was putting into holiday cards every year until I decided not to do them. While I enjoy creating our Christmas cards, sending them out, & having them as a keepsake, it is a lot of work. Plain & simple. Deciding not to do cards meant that I didn’t have to buy coordinating outfits for everyone, try to keep them unstained, plan a time to get a family picture, fight the boys who do NOT want to get their picture taken, edit the picture, find a cute card template or create my own, find a good deal to get the cards printed, buy envelopes, buy stamps, figure out who to send cards to, make sure addresses are up to date, put everything together & mail them out in time, & remember to give other people their cards when I see them. Simply not doing Christmas cards saved me a ton of time, energy, & brainpower — something that I definitely need to be conserving. We have a tree up & decorated, & we have some lights outside. Those are the two main elements that make it feel like Christmas in our household, & those were two things I made sure to do with my husband before he left for training last winter. Other than that, we didn’t dig out other holiday decor! We don’t have a ton of space for extra stuff, & I didn’t feel like swapping out regular decor for Christmas decor, just to switch it back in a month. I love homes that have beautiful holiday decor, & I’m sure I will do more with it someday; but right now is simply not the best time. There have been years where we have attended & hosted multiple holiday parties. Friend parties, family parties, work parties, & community parties. All of these festivities were fun, but we were all burnt out by the time we got to Christmas day. This year I have been saying, “no” to most invites, & the activities that I’ve said, “yes” to have been tentative answers. Parties sound fun until you think through all that is usually required — bring food, bring gifts, what to wear, do we need a sitter, etc, etc. Instead, we are doing a few holiday activities that bring the whole family joy, & then prioritizing time together instead of a whirlwind schedule. I do the majority of my shopping online. Taking two little boys to a crowded mall is just a painful & frustrating experience for everyone. Shopping online makes my life so much easier, & the few things that I plan to get at local stores, I will go shop for on my own & plan for it to be a fun experience for myself rather than something I have to simply power through. I really don’t know how moms did it all before the internet existed… shopping from my phone is my favorite way to shop! I am not good at saying “no” to new ideas or new opportunities… just ask Karissa 😉 I love to dive into new possibilities & partnerships, but I am learning the importance of prioritizing & putting things on-hold. 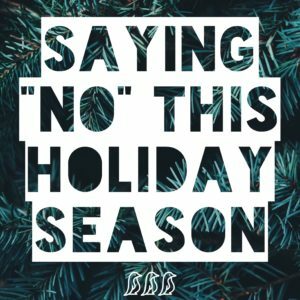 Working ahead & saying “no” to extras this holiday season is crucial. The reality is that the work will still be there after the holidays. This time of year is busy for every so it only makes sense to slow down & focus on the core of what needs to be done & leave the rest for the new year. I am learning to be very aware of how much I can take on without it being detrimental to my own health & the well-being of my family. What I am learning through this simplifying process is how important it is to think through each task & responsibility (no matter how small it seems). It is important to take inventory & evaluate on a regular basis to figure out what is working, what is making us happy, what is wearing us out. I am learning that most people don’t mind or don’t even notice when you cut back on activities, & that what you gain in return is often much greater than what you are giving up. Do the things that you love & leave out the rest.